We already know that Intel is planning to significantly reduce power consumption on next generation Haswell processors (down to as low as 10 watts) but a new rumor making the rounds this morning says we won’t have to wait that long before we see power requirements drop. 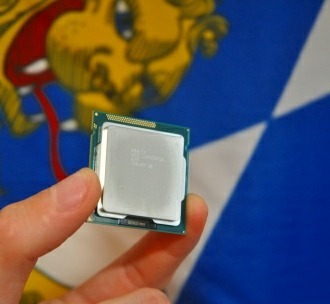 An industry source reportedly familiar with Intel’s situation told CNET that the chip maker is planning to lower power consumption on their existing Ivy Bridge line. Intel’s most efficient Ivy Bridge processors have a TDP of 17 watts, which works well enough inside Apple’s MacBook Air and dozens of Windows-based Ultrabooks. The source told the publication that revisions of Ivy Bridge will carry a significantly lower TDP although they stopped short of providing any solid numbers. A lower TDP of course means less power required to push the processor and in turn less heat. That’s good news for desktops and notebooks but the true goal of this initiative is to build a processor that is efficient enough to be used in a number of tablets. It’s here that lower powered chips are most desirable where things like battery life and heat generation help to play a key role in the overall success of a product. Microsoft’s upcoming Surface Pro tablet is still expected to use a 17 watt Ivy Bridge chip, making it one of the rare exceptions. Most other slates on the market use solutions from a number of different suppliers like ARM and Nvidia. Some ARM chips are rated at less than 2 watts and can be extremely thin, something that x86 chips haven’t been able to achieve yet. It’s unclear when these new Ivy Bridge chips may hit the market but it likely won’t happen before we celebrate the New Year.